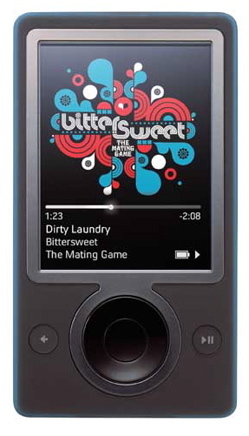 Microsoft announced that the Zune digital media player and online service will be available to consumers in the U.S. on Nov. 14, 2006. The “Zune device” will retail for $249.99 U.S.
A selection of preloaded content including at least 9 songs, music videos and film shorts are installed on the device‚Äôs hard drive to help consumers discover new artists and entertainment. A Zune Pass subscription gives consumers access to millions of songs for $14.99 per month. Users can also purchase songs individually using Microsoft Points for 79 points per track. Similar to a pre-paid phone card, Microsoft Points is a stored value system that can be redeemed at a growing number of online stores, including the Xbox Live Marketplace. Microsoft did not disclose any plans for podcast support in its announcement.